Special High Heat Treatment Iron Frying Pan High resistant for rust, caking and scratch, "STEEL TECH" series by SAKAI TOHJI 堺刀司 - IT International Co., Ltd.
We would like to introduce "STEEL TECH" frying pan series. 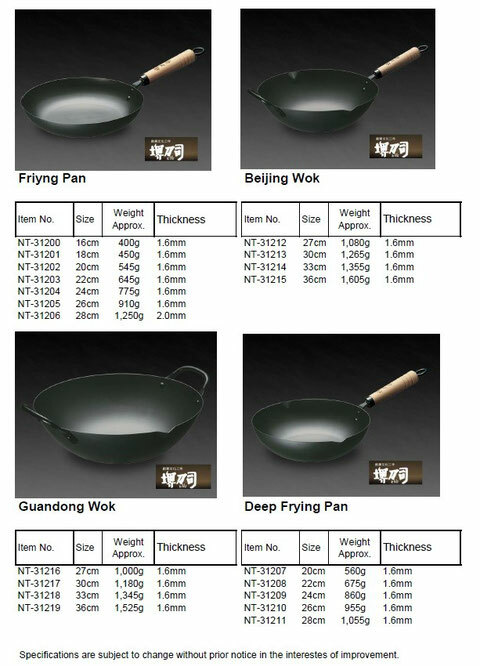 STEEL TECH, super grade steel frying pan forms 5 times harder oxidized layer comparing to normal steel pan by giving the special high temperature heat to the surface, which has over come the weakness of steel. It makes it highly resistant to rust and incredibly strong and durable. 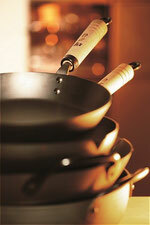 Not only western style pans, Chinese style (Beijing style and Guangdong style) also available. STEEL TECH is not coated steel. Not having a rustproof coating saves the labor of preburning to remove it. You only need to wash in water to clean it completely after use. 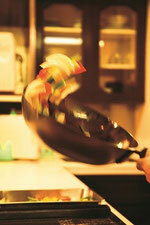 Corrosion resistant steel facilitates usage of metal spatulas. Health benefit by digesting iron. will not get scratched easily. •Naturally adds dietary iron to all food prepared with it. make clean up a snap. SAKAI TOHJI locates in Senshu Sakai, the southern part of Osaka. At the entrance of the factory, the copper gas lamp and the large sickle welcome you quietly. 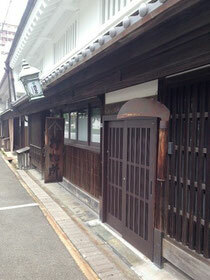 Seeing the appearance, you feel the long history and tradition behind the company. SAKAI TOHJI established in 1805, we need not to say their superior reputation for knives with high quality backed by their history, is also enjoying an appreciation for other high quality cooking utensils such as pot and frying pan made by applying their traditional master's technique and pursuing new technology. If you have any questions or need further information, please feel free to contact us by e-mail.